The ancient kingdom of Parro has been invaded by the armies of Mongaul, and its king and queen have been slain. But the "twin pearls of Parro," the princess Rinda and the prince Remus, escape using a strange device hidden in the palace. Lost in the Forest of Rood, they are rescued from Mongaul soldiers by a strange leopard-headed man named Guin, who has no memories except for the word "Aurra." Guin Saga is the longest continuing single writer’s work in the world. The main story of Guin Saga resumed on November 8, 2013, four years after the passing of the original author. Atsushi Wakabayashi is directing the anime, while famous video game composer Nobuo Uematsu is creating the score. This is Uematsu’s first full soundtrack for an anime, and Wakabayashi’s first directing role. Guin Saga (グイン・サーガ Guin Sāga) is a best-selling heroic fantasy novel series by the Japanese author Kaoru Kurimoto, in continuous publication since 1979. Animation production was handled by Satelight and the background art by Studio Easter. The animation is good to great on some parts but then is poor in other. Take the horse animation for example. It’s like watching a stiff animal that just barely moves its feet and glide across the ground. The art is very inconsistent. 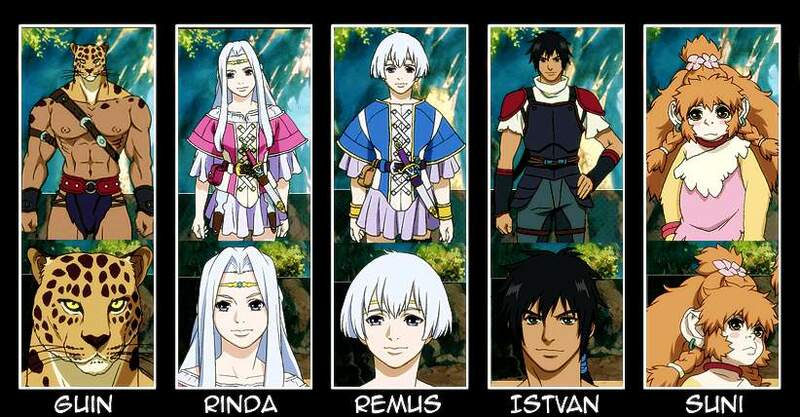 The style, however, is very reminiscent to Heroic Legend of Arslan, where it has that Persia influence to it. Combats are very basic and don’t convey any sense of danger. You either have a character so overpowered that they take down multiple opponents in one swing, or you have a fight where people just swing their sword around. The fighting and tactics showed in the anime feel like it was written by someone who had never been in a fight or read any real tactic strategy. The opening theme “Theme of Guin” (グインのテーマ Guin no Tēma) by Nobuo Uematsu and the ending theme “Saga~This is my road” by Kanon are both quite epic in their own right. The ending song is also quite haunting. The music is probably the one and only good thing about this series. I have never read the original novel and can only speak for the anime. Almost everything tells you they have a high aspiration for the series, but the execution just isn’t there. Most of the main characters are tolerable, just none are really likable. The way people act does not seem natural, it’s as if they are actors playing out a play and each serves a specific function in the plot. Adult characters act like teenagers full of angst. So far, I am not very impressed with Satelight track record. I can’t say I would recommend this anime, but it’s not bad enough for me to tell people to stay away either. Maybe keep it on your last resort list. Guin Saga contains graphic violence and is intended for young adults.